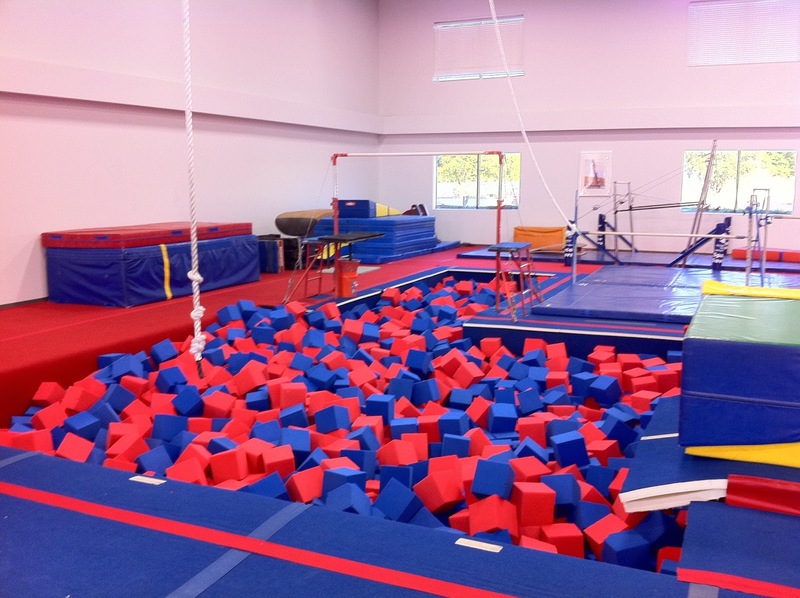 On Saturday morning, I took Ladybug to gymnastics class like any other Saturday. We hadn't been to gymnastics for a few weeks due to the holidays and at least one week of me deciding "meh". Nevertheless, we were back and Ladybug was ready. She loves climbing and flipping. And she's actually getting coordinated enough to keep her arms locked to do handstands. She's a tiny little gymnastics beast. We went through the first couple of activity courses without an issue. Stretching no problem. Obstacle course, my baby is a BEAST! Next up trampoline, with a jump into the foam pit. Ladybug loves the trampoline. In fact she'll try to bypass other apparatus in order to get to get to it faster (NOOOO!!! I NEED TO JUMP!!!) The goal was to bounce over two ropes and then jump into the foam pit. Easy peasey. Not actual pit - but doesn't it look fun? While the teacher was setting up the ropes, Ladybug jumped in the foam pit. Because she's a thug apparently. Also - foam is fun. I honestly have no memory of what happened between this and the incident. No clue. I don't know if I blocked it out of memory, or if it's oxygen deprivation, or if I was that traumatized. I'm not sure. All I know is I was in the pit. And I couldn't get out. Could not. Un able. Stuck. Trapped. Drowning in foam. I needed a life guard. And a life coach. And Dolvett. Dolvett would've made it all better. Allllllllll.... betterrrrrrrr. The foam sticks to fabric. So my first thought was, if I take off my socks, I'll be able to get leverage and get out. Next thought, if I can get to the edge I can pull myself out. I obviously had started hallucinating at this point. I have no upper body strength. I can haul around Ladybug and her stuff but.. That's it. And on top of that, the edges of the pit weren't permanent structures, you pull on them, they move. Stuck. Ladybug is no longer in the pit. Again, I have no recollection of pulling her out (or putting me in). I say out loud, I'm stuck. Ladybug, because she's a good daughter, tells her teacher "My mommy's stuck." The teacher doesn't believe this. I mean, who gets stuck in a foam pit? She comes over and asks if I'm stuck. She puts her hand down and tells me to step on it. The teacher is about 84.5 lbs. I am way more than that. Wayyyyyyyyyyyyyyyyyyyyyyyyyyyyyyyyyyyyyyy. Not going to work. She tells me she's going to get a mat, I can pull myself up on that, then out. Um no. I can't pull me out of air with my arms. After the longest 10 seconds of my life, I was able to step on the mat, then out. I was free from the foam pit monster that had consumed me. And I was hot and sweaty. But none of the other parents laughed at me. And that was nice. Cause it was funny and I was surely laughing at myself. I'm giving that foam pit a wide berth from now on. It's gotten a taste, I think it's out for blood. I really feel for you. I thought for a second that Ladybug got stuck and I was freaking out for you! I hate,hate, hate those pits for precisely that reason!! I would have been absolutely mortified and probably would've had a panic attack.